How to choose the best campground in the park. Yosemite National Park is the perfect place to take the family for a camping vacation. There are many campgrounds within the park, but I want to concentrate on a few that, in my opinion, are a pick of the best in the different areas of the park. When reservations are needed, this is mentioned below, you will have to make them about five months in advance. If you will go to a first-come, first-served campground, be sure to arrive early as they fill up fast. Yosemite Valley is basically the hub of the park, with numerous sights to take in within a short distance. Upper Pines Campground is open all year and has 238 sites available. You'll need reservations from December to March 15th; otherwise it's first-come, first-served. If driving an RV, you can use this campground if the RV is 35 feet or less. If you are hauling a trailer, it must be 24 feet or less in length. I like this campground because you are near Curry Village where you can get showers, amenities needed and are close to where the action is. At an elevation of 4,000 feet, you are high enough to make you feel a bit lightheaded if you aren't used to it. There are lots of activities for families. You can even rent a bike as the perfect way to get around. Another great campground in the valley is North Pines. It's only open from April to September and you'll need to make reservations. RVs are permitted up to 40 feet. If you are hauling a trailer, it must be 35 feet or less in length. Again, you are in close proximity to Curry Village where you can get a shower easily, and pick up odds and ends at a store. This campground is largely shaded for a greater part of the day. This makes for nice camping during the summer. North Pines Campground is also one of the most popular in the park, thus can be a bit crowded. Situated beside the Merced River, you can get some sites with both shade and near some river rapids, such as Site 502, 504 or 506. I can't recommend a more idyllic place to spend a Yosemite vacation! South of the valley, and in an incredibly scenic landscape, you can enjoy the Bridalveil Creek Campground from July through September. This is a first-come, first-served campground with 110 sites, so you will most definitely have to arrive early. Situated at an elevation of 7,200 feet, the air is thinner than you would expect, but fresh and invigorating! RVs are permitted here up to 35 feet, and trailer length is up to 24 feet. You'll be roughing it at Bridalveil Creek more than if you were camping in Yosemite Valley, but you may prefer it this way. It's a 45-minute drive to the valley for access to showers. You can get groceries in a small store in Wawona. You'll love the hiking close by along with some nature trails and interpretive programs. Approximately 45 minutes northwest of the valley you'll find Hodgdon Meadow Campground. This beautiful campground is open the whole year through, and has 105 sites. If you've driven an RV and it's 35 feet long or less, you can stay here. Trailers are allowed up to 27 feet. There's a small grocery store at Crane Flat when you need to pick up some essentials, but you'll have to drive to Curry Village or Housekeeping Camp for a shower. Reservations are only needed from the middle of April to the middle of October; otherwise you can arrive early for the first-come, first-served sites. Lots of squirrels around this area, and you may have to watch for them and protect your belongings more than from bear activity. However, use the food storage so you don't attract any of the larger furry critters to your site. From here, you can hike to the Upper Yosemite Falls, an incredible view. Tuolumne Meadows is about an hour and a half northeast of Yosemite Valley up the Tioga Road. There are 304 sites with RVs and trailers permitted up to 35 feet. This is a 50% reservation campground, so if you want to get a first-come, first-served site, you have to get here early. This is the high country and you'll be at 8,600 feet. But I strongly suggest staying at Tuolumne Meadows because of the clean and fresh mountain air and the incredible scenery. You can grab a shower outside the park at Lee Vining, and get groceries at the nearby Tuolumne Meadows store. Best of all, you have easy access to lots of outdoor recreation, such as fishing, backpacking, horseback riding and hiking. 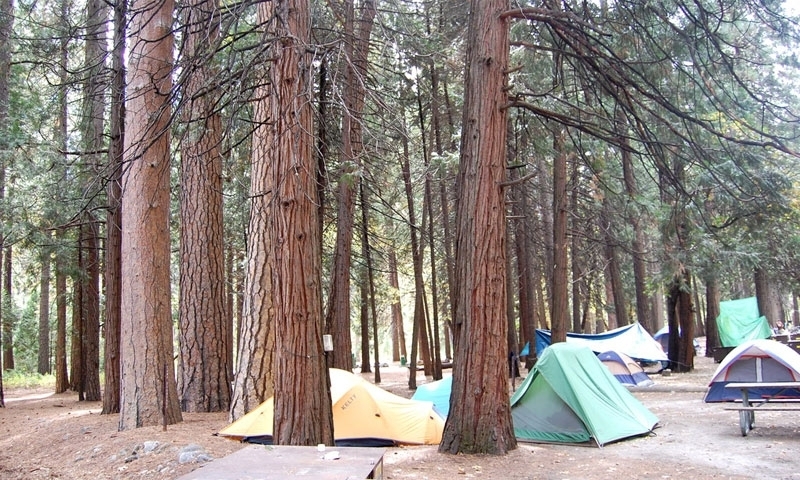 When you really want to get away from it all, you can try the High Sierra Camps. These are a string of camps that you can only reach by foot or by horse. They're spaced anywhere from 6 to 10 miles apart on a trail that moves through the high country. The High Sierra Trail becomes more doable when you don't have to haul a pack with you and can stop at one of the camps for meals and bed. As you climb, you will enjoy the best of Yosemite, from the jagged peaks and passes to the lovely alpine meadows. It's an experience you shouldn't pass up.